Exercise Red Flag, Nevada, sometime in the mid 1970’s. A line of Grey/Green camouflaged aircraft sit baking gently on the hardstanding. This is not one of the usual shapes seen at Nellis AFB. The nose tapers to a point, a refuelling probe sits in front of the windshield, the fuselage is dramatically area ruled with two round intakes in front of the swept back and stubby wings, a bulged underside hides the internal bomb bay, wings jet orifices sit either side of the fuselage, the tailplane sits atop the broad fin, the tail behind the fin is chunky, lumpy and even more pointed than the nose. It looks like it could act as a bouncer at any Las Vegas casino. These are the Hawker Siddeley Buccaneers S2’s of 208 squadron RAF. Taking off, the pilot retracts the undercarriage and drops to a height so low they are almost touching the desert floor. Target in sight, they pop up, drop their load, turn for home and drop down to the desert floor again. They don’t skimp on speed either, get there, do the job, get back, no compromise. Exercise finished they have a debrief, a success, the only ‘enemy’ that could even contemplate touching them was an F15 with look down shot down capability. Impressive to say the least. Some genius thinks up the tagline ‘208 penetrate’, indeed. 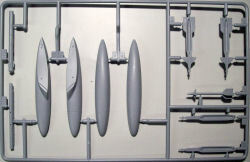 As it was designed to fit onto the smaller British carriers the ‘Bucc’ had a small wingspan which would normally indicate a high landing speed, however, the clever boffins at Blackburn used a technique called ‘blowing’ to fool the wing into thinking it was going faster than it was and therefore provide the requisite lift at lower speeds. There were full span slots on the wing and tailplane leading edges through which compressed air was forced thus creating a faster airflow over the wing and giving higher lift. Speed was still high so they added a huge split airbrake at the rear of the aircraft, oh, it also had a arrester hook. Early Bucc’s had a power problem with the De Havilland Gyron turbojets which was solved in the Mk2 with the uprated Spey’s, incidentally the same basic powerplant used in the Phantom F4K & M. One story told to me by an ex RN engineer was how the ejector seat was given a pressure switch to automatically activate it 25ft under the sea, this was following the loss of life when, on some failed takeoffs, the crew could not get out of the sinking aircraft. Following the cancellation on the TSR2 and the later F-111K order the RAF lacked an aircraft to fulfil the low level recon/bomber role, reluctantly, having already rejected the Bucc in the early 60's, the RAF added them to it's fleet, and never looked back. When the Royal Navy lost it's carriers all the Phantoms and Buccaneers left were transferred to the RAF. The RAF had a problem the Navy never did, the wings dropped off! Designed to fold for stowage inside a carrier the RAF never had a need to fold the wings and so the joints deteriorated from lack of use and the seals failed. Some photos do show the RAF Buccaneers with folded wings, but this is more than likely after the problem became known. The Buccaneer served with the RAF from 1970 and it's swansong was the first Gulf War where it for some of the time it illuminated targets for the Tornado force. The Bucc was well liked by crew as it gave a really smooth ride at low level, was built like a proverbial tank, and did exactly what it said it on the box. South Africa was the only other Air Force to use the Bucc and did so in offensive operations against rebel forces in Namibia and doubtless other wars. The only flying Bucc today is stationed at Thunder City in Cape Town where you can pay for a flight, my pennies are woefully lacking in this respect. Airfix first released a kit of the Buccaneer when it was still being developed as the Blackburn NA39 including, if I remember rightly, a folding nosecone and opening airbrake. 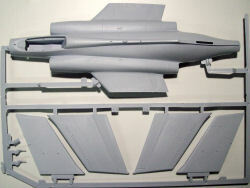 A later release saw Airfix kit the Buccaneer S2. This is a re-release of that second kit with newly tooled sprues to bring it up to Gulf War specification. Presented in the now standard Red Airfix box and lid with an action packed picture on the lid of 2 S2’s dropping ordinance on some poor unsuspecting Iraqi’s head. I do like the new packaging as it shows the options you have available on the outside, even though it says the contents may vary? 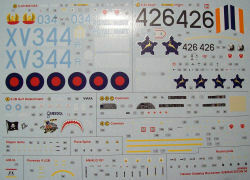 The box contains the kit in a plastic bag with the canopy in it’s own bag, a real thick wad of instructions that fill the box lid, colour 3 view illustrations of each of the 3 variants which on their own are worth framing and an accurately printed decal sheet. The 3 options are for an S2B of the Lossiemouth Buccaneer wing from the 1991 Gulf War, basically a mix of 12 & 208 squadrons, an S2D from 809 NAS (Naval Air Squadron) and a South African Air Force 24 squadron Smk50. 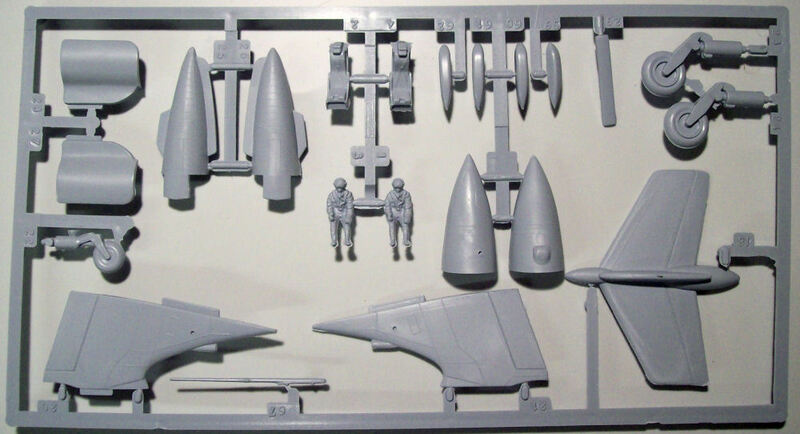 The kit itself is produced in the now customary Airfix gray plastic, one of the new wingtips was broken, no problem as I won’t be doing that version. Both normal and bulged bomb bay are offered but there is no provision to open this. 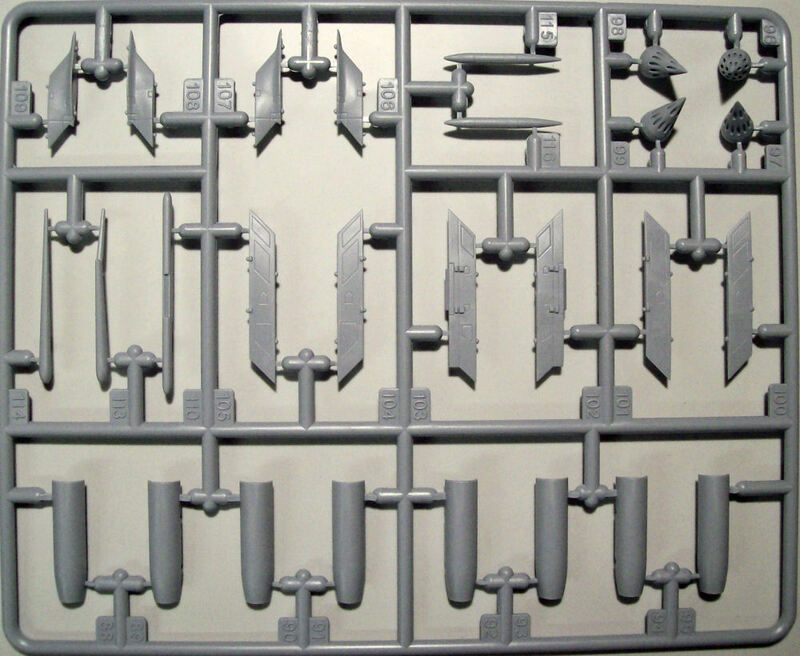 Panel lines on the old moulding is raised, on the new sprues engraved. There is some flash present on the old sprues but nothing a quick swipe wouldn't cure. 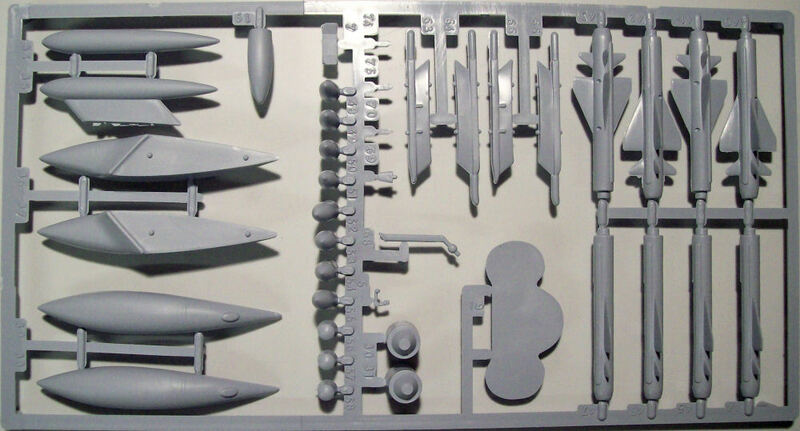 There are 2 new sprues containing revised wingtips, pylons, 4 rocket pods, extended wing tanks, 2 Paveway II bombs, 2 AIM9L sidewinders, AN/ALQ 101 and an AN/ALQ 23E Pave Spike pod. 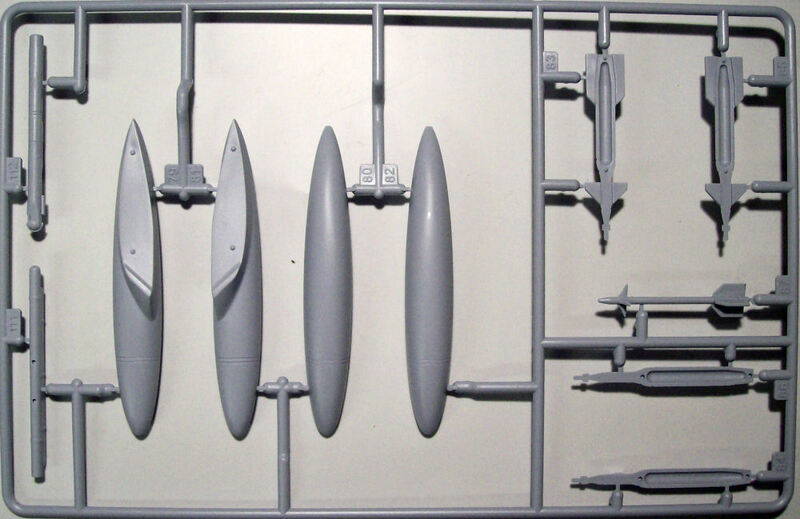 The pods are one piece moulding and quite good, I can't say the same for the bombs or Sidewinders, the fins are really thick, on the Paveways they would be about 6 inches. The fuselage is split horizontally and the wings split at the fold line, handy if you want to show this option but it will need detailing. Inside the intake there is a noticeable ejection pin mark as indeed there is under the tailplane. There are engine front faces on a bulkhead which sits at the back of the intake. The cockpit tub is moulded into the top half no detail but a bit of a step to indicate the side panel, decals are provided for the instrument panels and the small clear panel inside separating the pilot from the navigator. The ejector seats look quite accurate and also include seat belt detail, but only for the top half, not the seat, curious. The rear airbrake is supplied in 2 halves but again there is no detail inside which is a real shame as this is a very prominent feature of the ’Bucc'. Wheel wells are deep enough but again. no detail. The undercarriage legs and wheels are moulded in 1 piece with no detail on the hubs, in my mind a serious omission. The re-fuelling probe looks like a blob on the end of a pole and could do with work. The jet pipes on the other hand have a lovely thin edge. 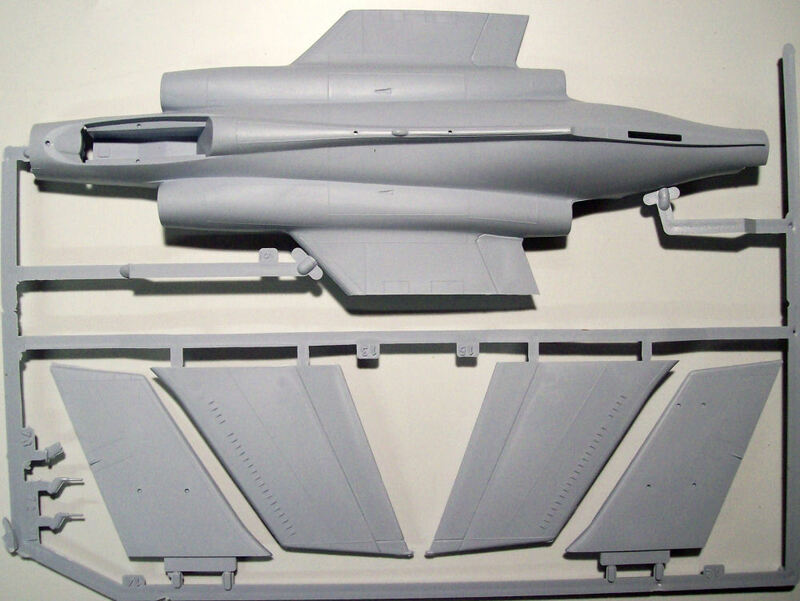 The canopy and windscreen moulding is clear and reasonable but is missing the detonation cord, don't forget if you want to model it open the canopy slides backwards and is not hinged, another feature due to use on carriers. 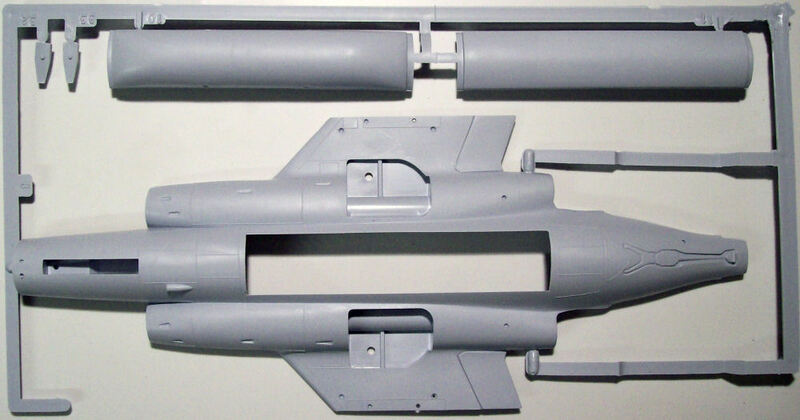 Optional parts are provided or the different aerial fits for each version, a bulged bomb bay and short wingtips for the Gulf War S2B which means a little bit of wingtip surgery if you want this version. 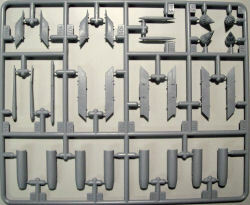 Some parts are included that are not mentioned on the instruction sheet, racks and Martel missiles with a choice of noses. and parts 59 - 63 of which I have no idea what they are. Each bomb bay section has an arrow moulded in it to show you which way round to put it, nice touch. The instructions are clear on which option is which. The painting guide is in Humbrol colours only but some BS colours are identified. I recommend visiting the IPMS Sweden website for colour translation to other makes. 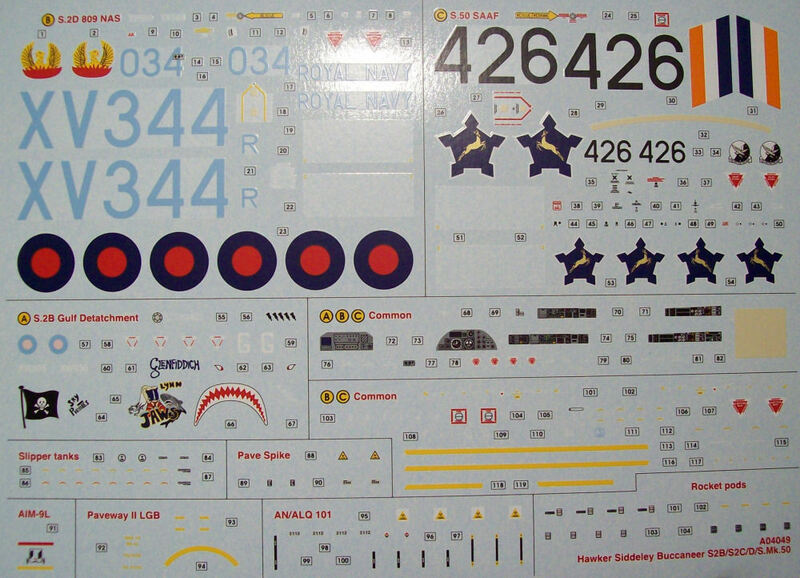 The decal sheet is full of superbly printed detail, even for each individual weapon option (but not the Martel’s). Do I like this kit? It has its highlights and weaknesses but yes, I will eventually build it. Is it worth it? Well, it is the only kit in 1/72 scale, unless that is you can afford the superb CMK kits, which I can't, so the answer is a reserved yes.